Epiris today announces that Epiris Fund II, advised by Epiris LLP, has agreed the acquisition of Bonhams, the global auction house, from private shareholders. This is Fund II’s fourth investment. Financial terms are not being disclosed. 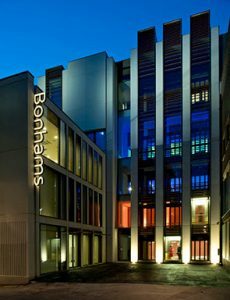 Founded in 1793, Bonhams is one of the world’s largest and most renowned auctioneers of fine art and antiques, motor cars and jewellery. The business holds more than 250 sales a year at its flagship salerooms, which include London, New York, Los Angeles and Hong Kong. In 2017, Bonhams sold more than 50,000 lots, generating over £450 million of hammer sales. The company is led by CEO Matthew Girling and CFO Jonathan Fairhurst who will be joined by Bruno Vinciguerra as Executive Chairman. Bruno served for eight years as COO at Sotheby’s, and before that held senior roles at Bain, Dell and Disney. This entry was posted on Wednesday, September 5th, 2018 at 7:51 am	and is filed under Miscellaneous. You can follow any responses to this entry through the RSS 2.0 feed. You can leave a response, or trackback from your own site.